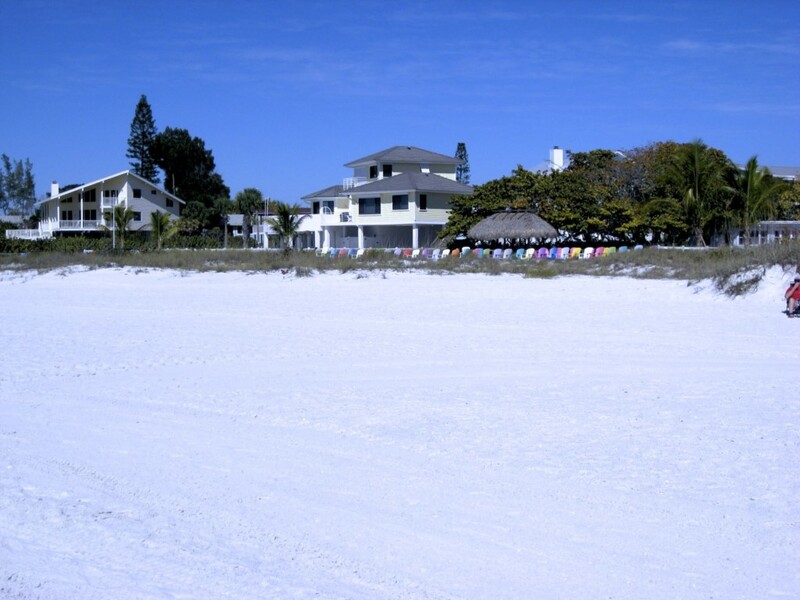 The Anna Maria Island Beach Palms 5B is completely surrounded by water and has just been completely updated with a new state of the art ultra high efficiency air conditioning system with all new duct work, 3 new flat screen televisions, 2 new bedrooms suites, all new mattresses, all new bedding, all new towels, new furniture, new window coverings, modern appliances, all new ceiling fans and keyless door locks. 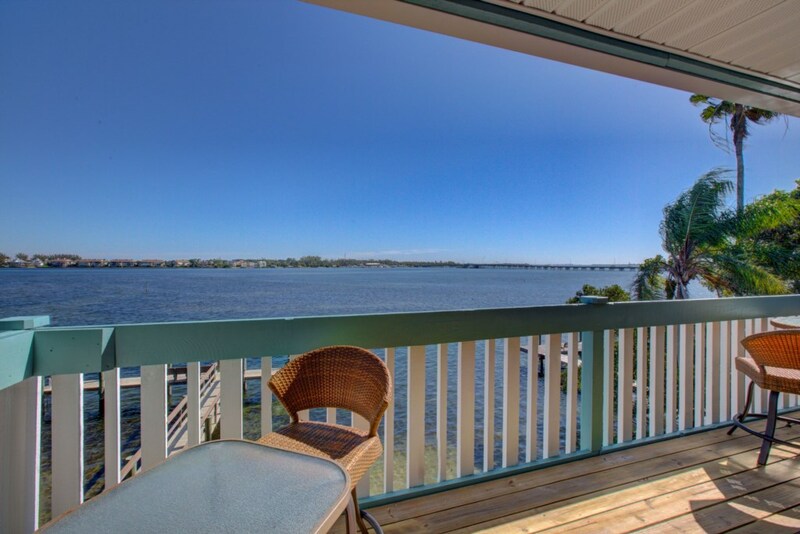 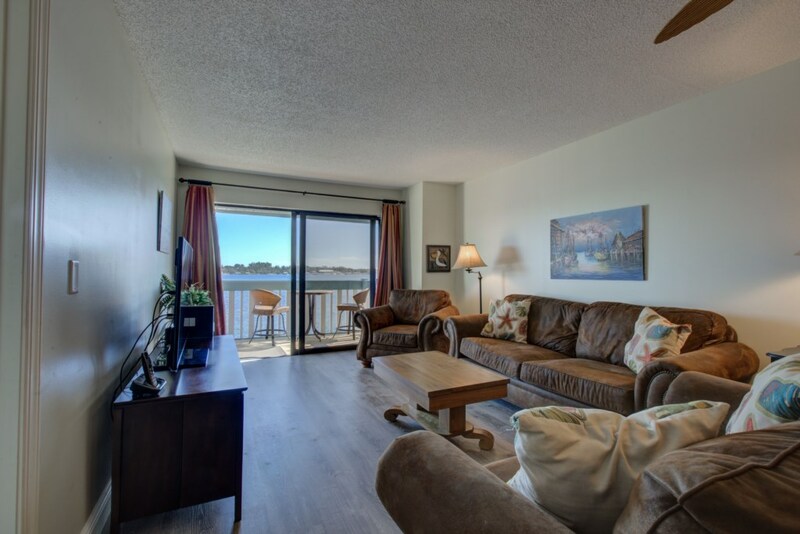 This is a gorgeous 2 bedroom, 2 bathroom condo that sleeps six and offers you a view of the water from every room in the condo, high speed wireless internet, a boat and fishing dock, heated pool, 2 balconies west and east and 2 parking spots. 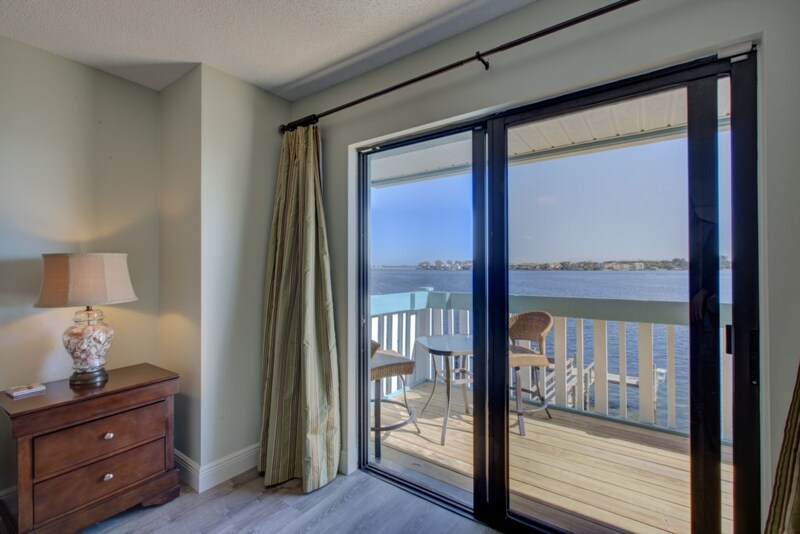 The east balcony directly over looks the Bay and fishing dock and is accessed by sliding glass doors off both the living room and master bedroom. 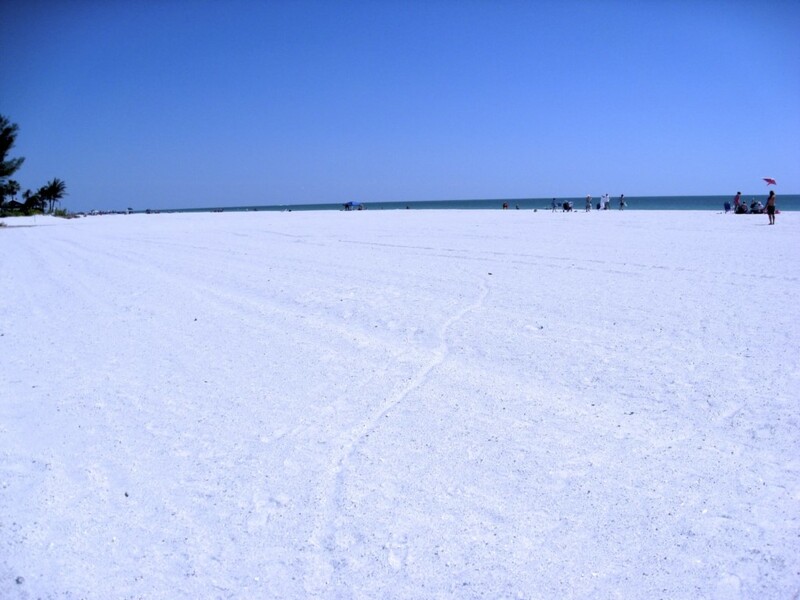 You can watch the ships sail up and down the waterway on there way to Tampa Bay and the Florida Keys. 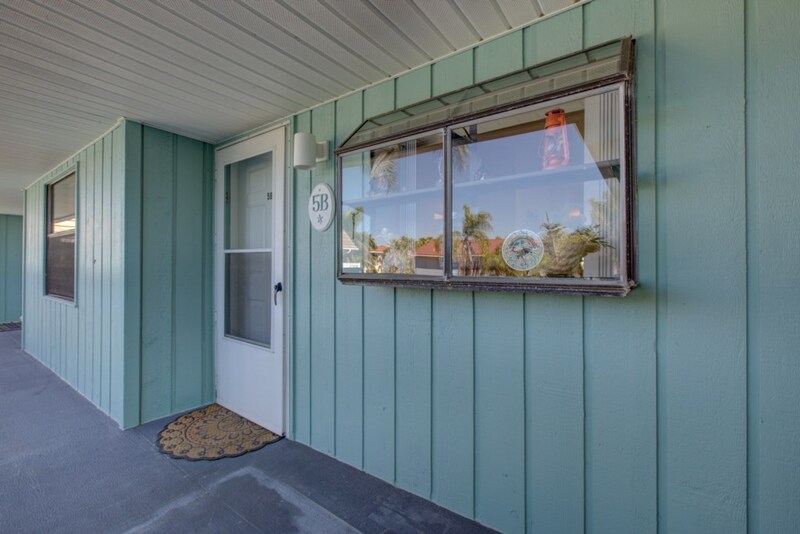 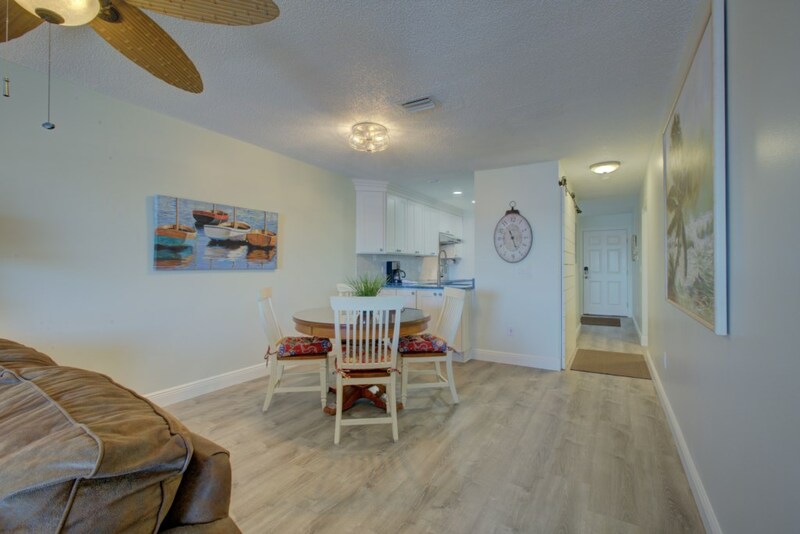 The Beach Palms is located 125 yards from the beach and a one minute walk along the brick walkway will take you the the each. 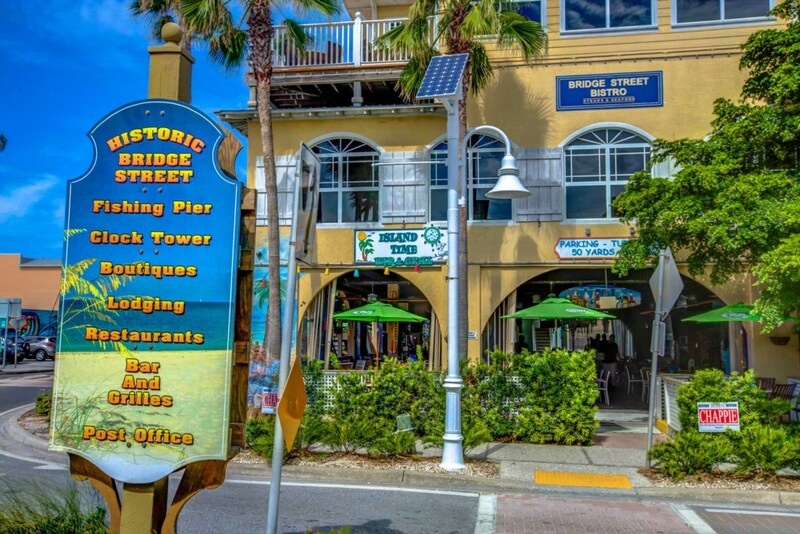 The Beach Palms is also located with-in walking distance of Anna Maria Island's best waterfront restaurants, beach shops, gift shops, shell shops, boutiques and the quaint shopping village on Bridge St. that leads right out onto the Bridge St. a pier famous for strolling, fishing and eating and the new Rotten Ralph's restaurant at the end of the pier. 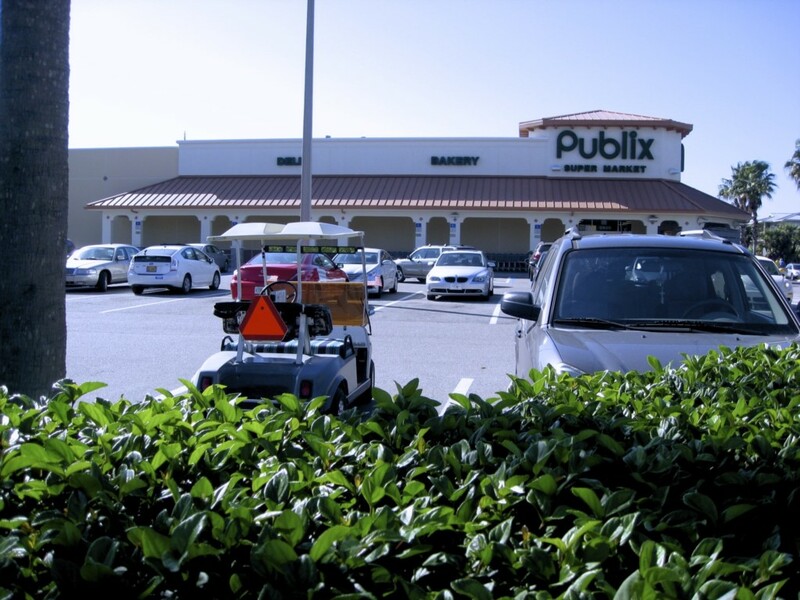 There is a great grocery store right on the island, a fantastic Wal-Mart Super Center 5 minutes from the condo and a great shopping mall with all the big department stores as well. 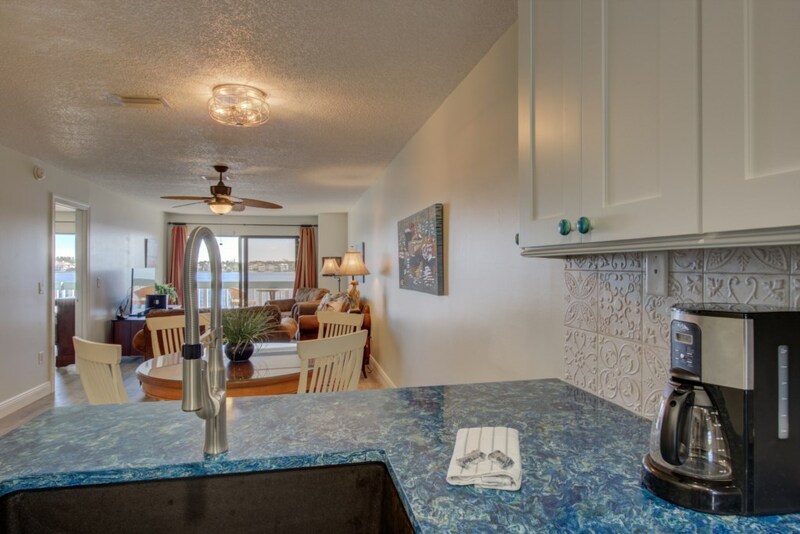 Amenities include, washer/dryer, new high efficiency central air conditioning system, new water heater, refrigerator and freezer, ice maker, glass stove top, microwave oven, new pots, new pans, new cookware, new dishes, new utensils, new coffee cups, new glasses, new cappuccino/espresso maker, new kettle, new blender, food processor and toaster, new telephones with unlimited long distance calling, free local calls, WIRELESS HIGH-SPEED INTERNET, new phones, new ceiling fans in every room, iron and ironing board, alarm clocks, cable television, new patio furniture, beach chairs, beach toys, outdoor shower, and private sheltered parking to keep your car out of the intense Florida sun. 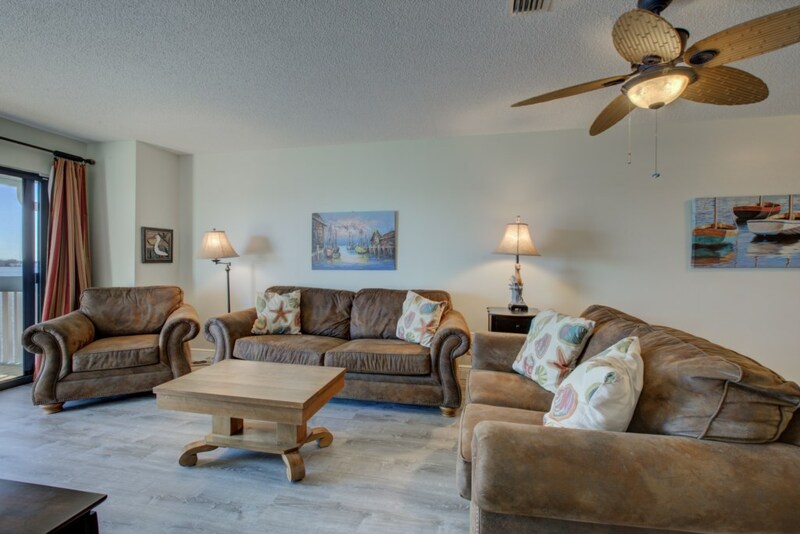 The living room features a new 50" high definition smart television, new television console, new window coverings and new ceiling fan. 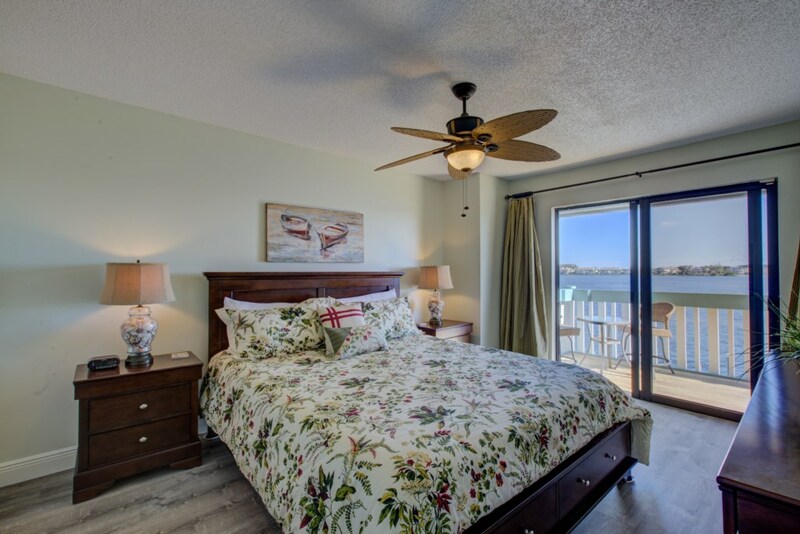 The master bedroom offers you a new California King size bed with new memory foam mattresses, new linens, new pillows, new 37" flat screen television, new ceiling fan, and new window coverings. 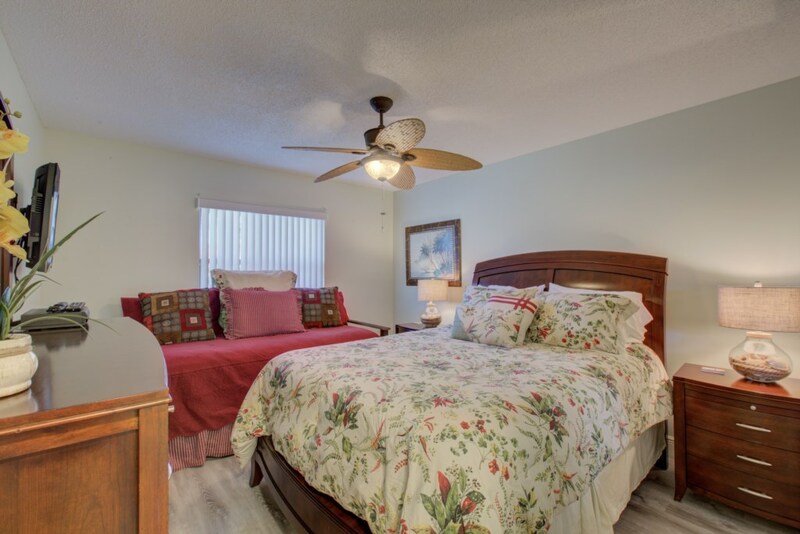 The guest bedroom offers you new ceramic floor for good hygiene, a new bedroom suite with a Queen size bed, a new twin bed, new mattresses, new bedding, new ceiling fan and a new 37" television. 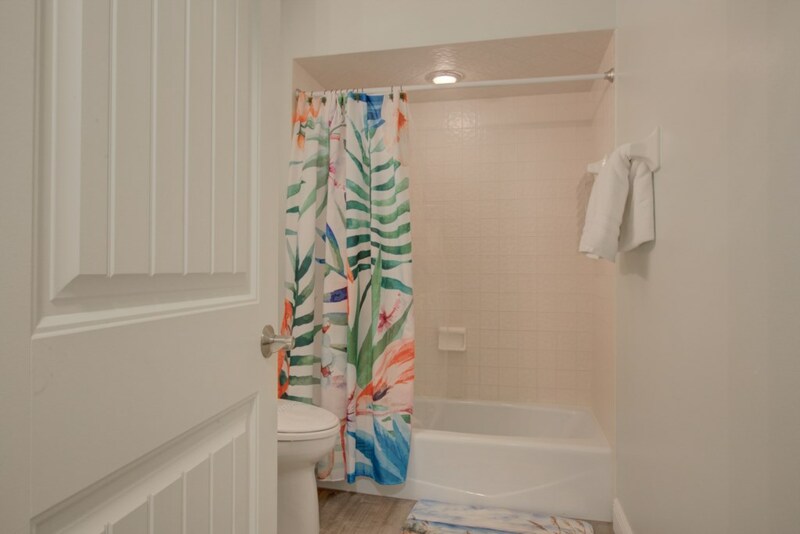 The second washroom has been upgraded with new ceramic tile and high efficiency commode. 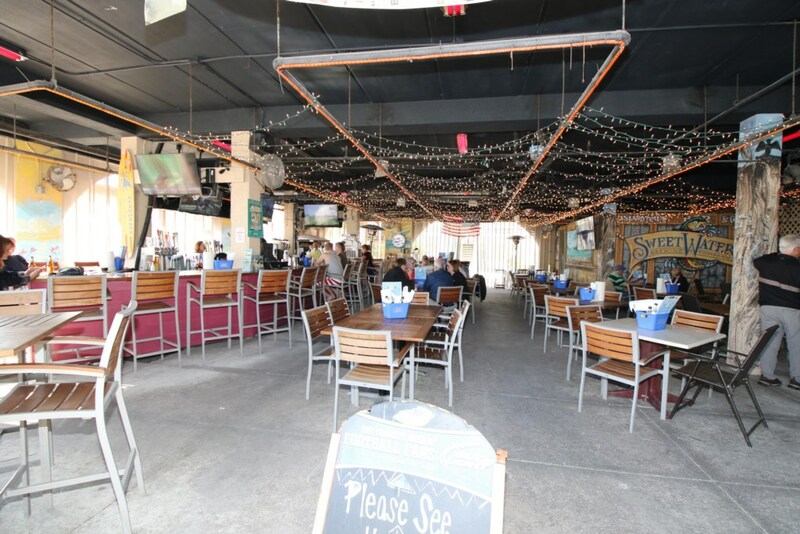 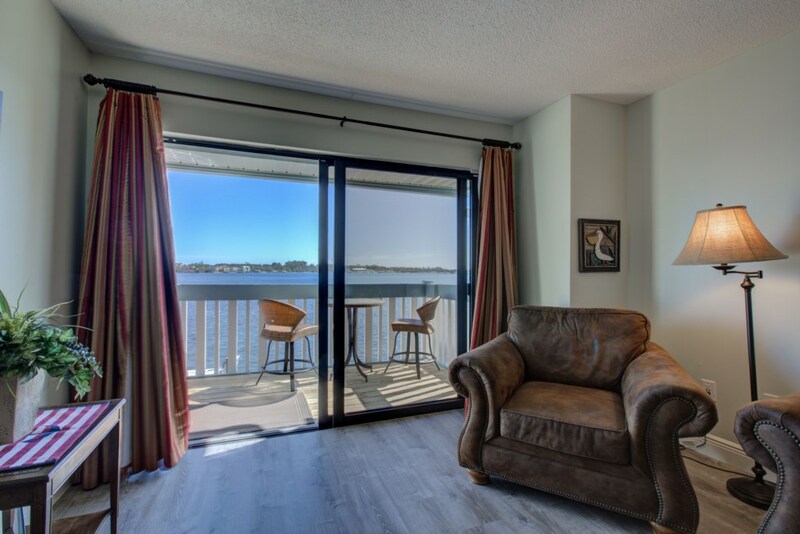 The east balcony directly overlooking the water and fishing dock offers you a new patio furniture featuring deck height swivel chairs. 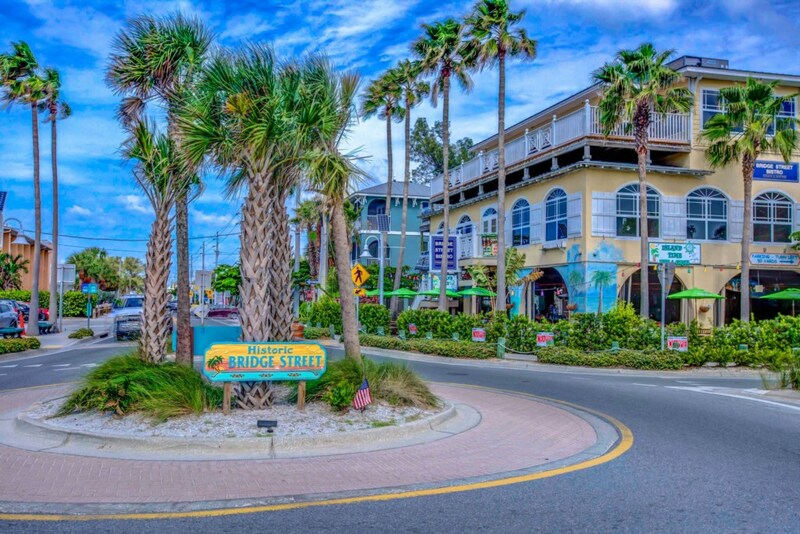 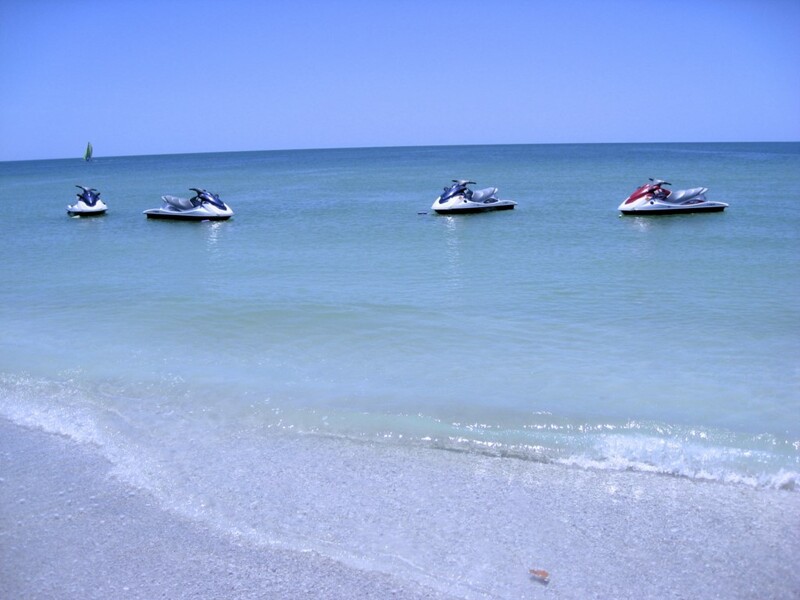 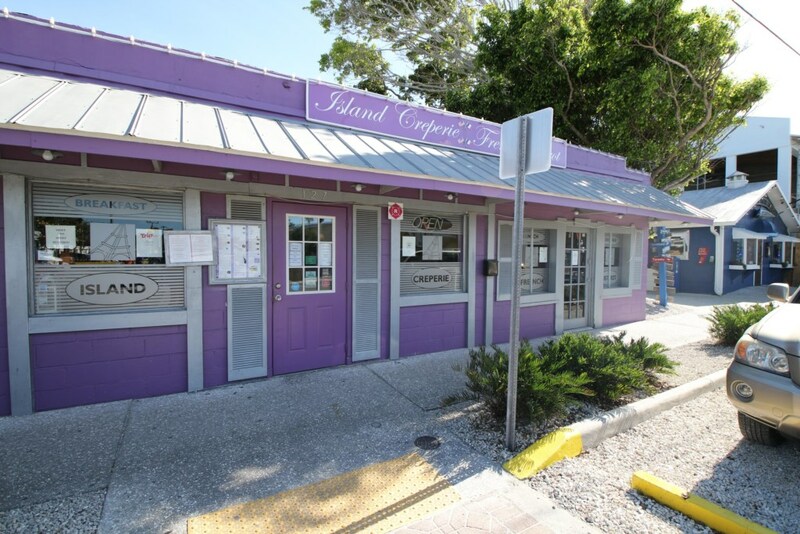 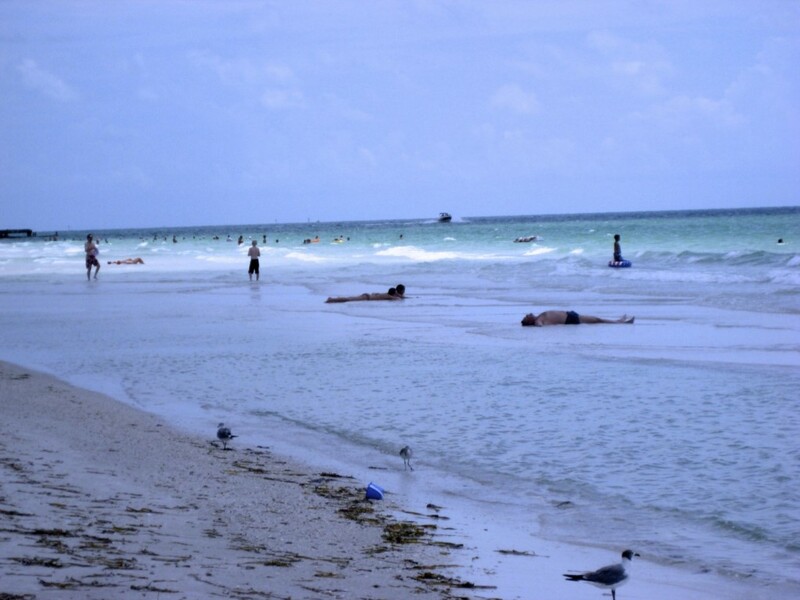 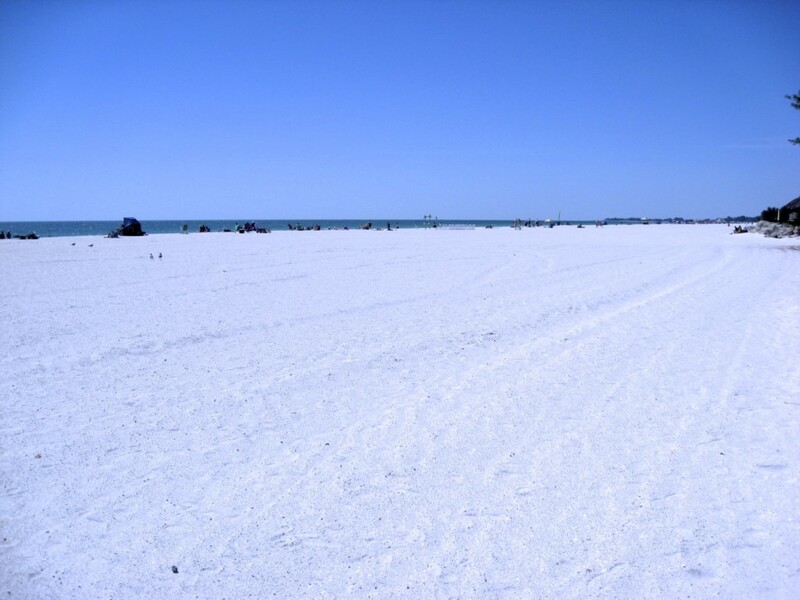 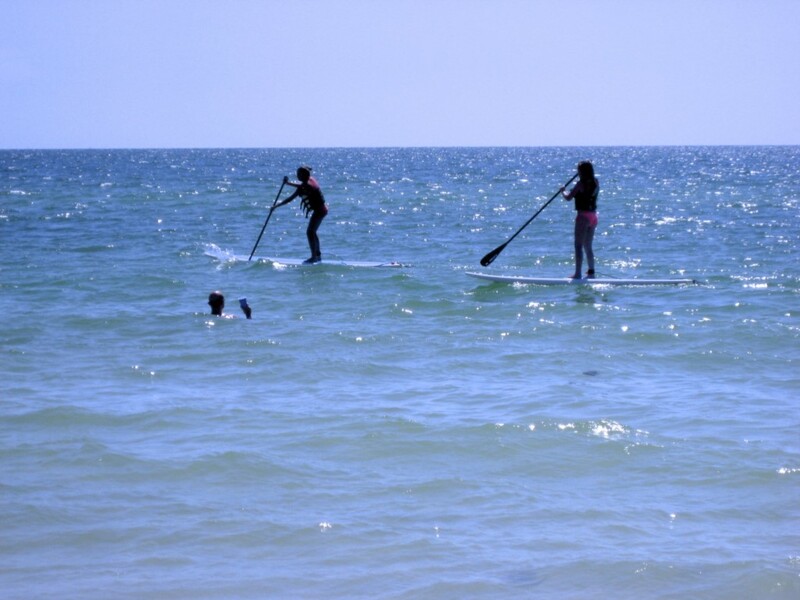 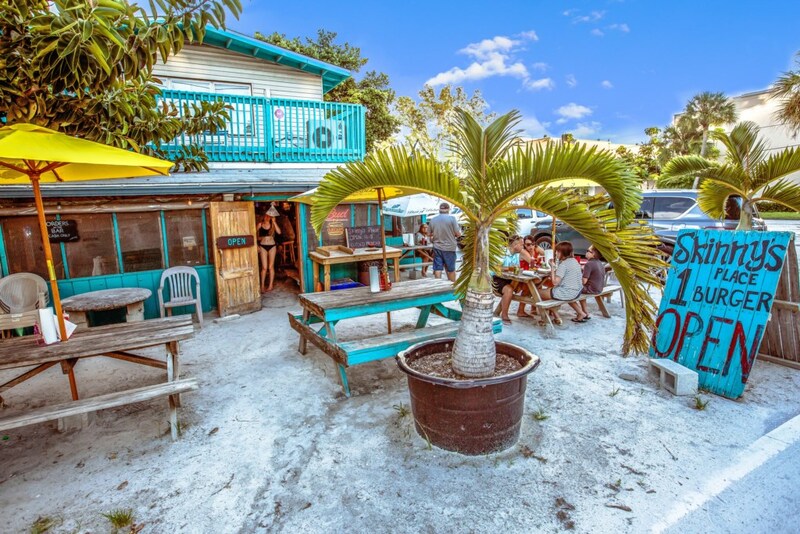 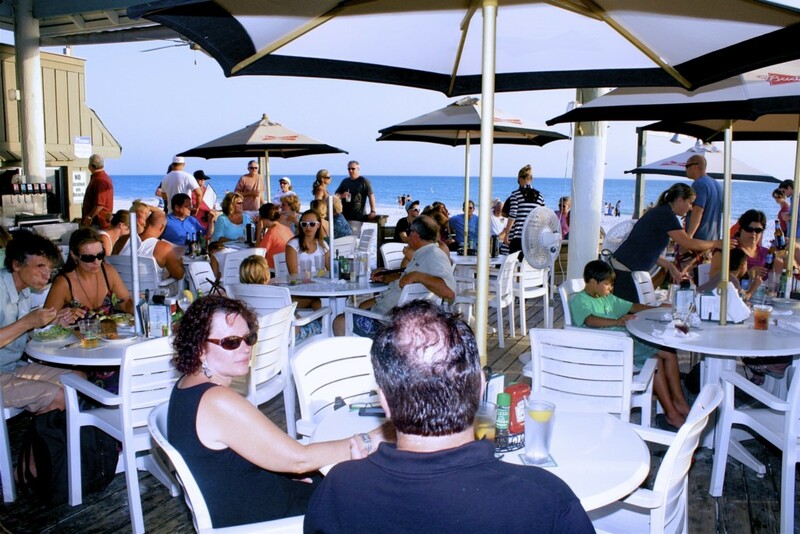 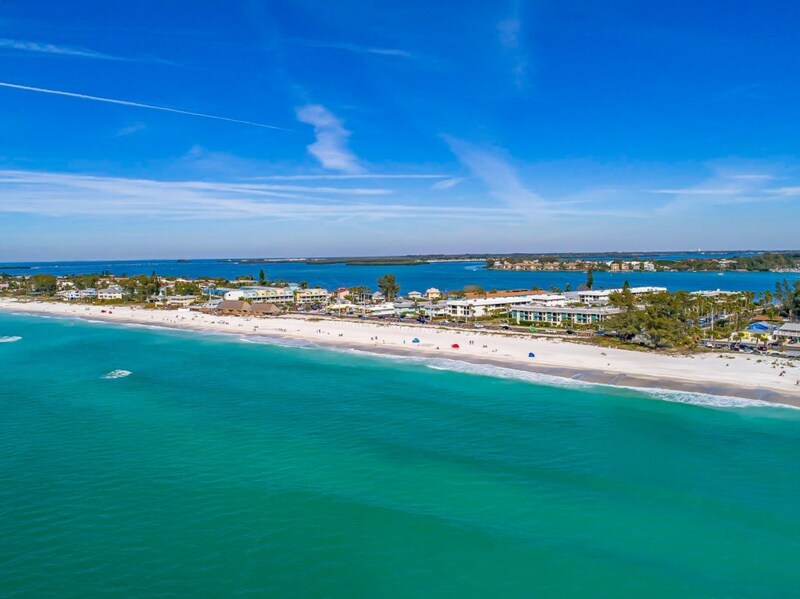 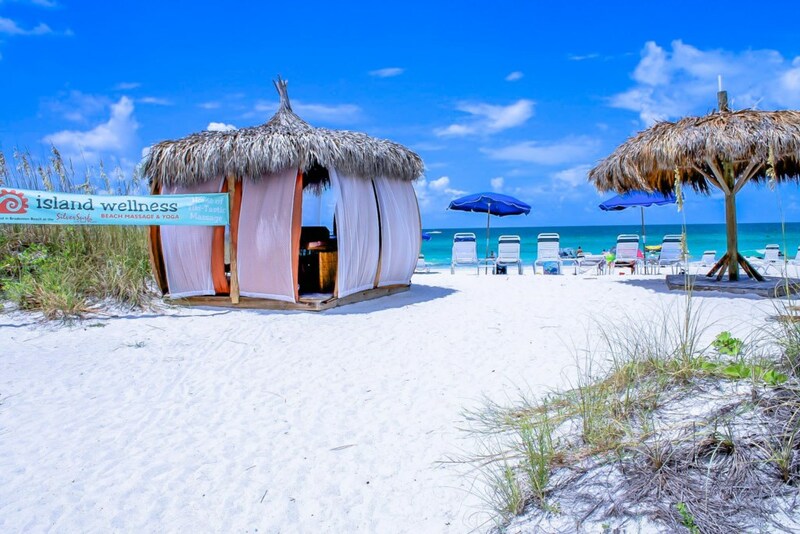 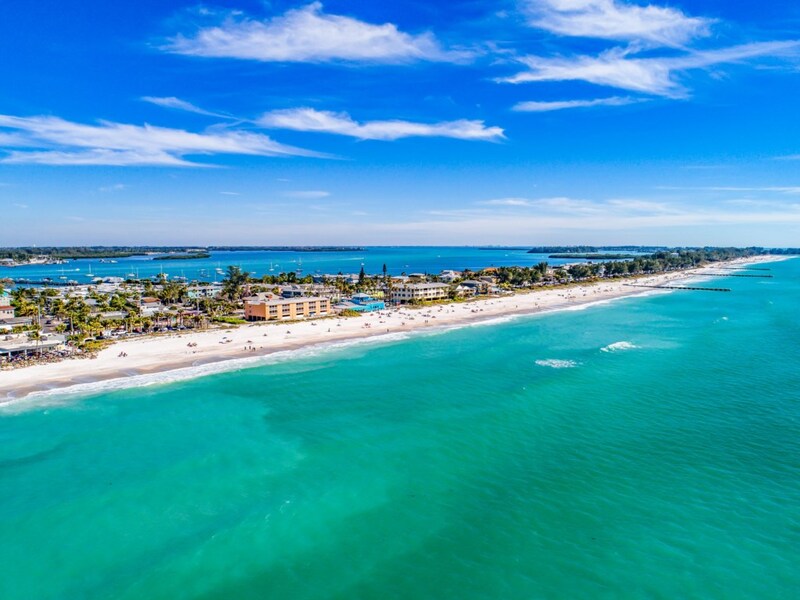 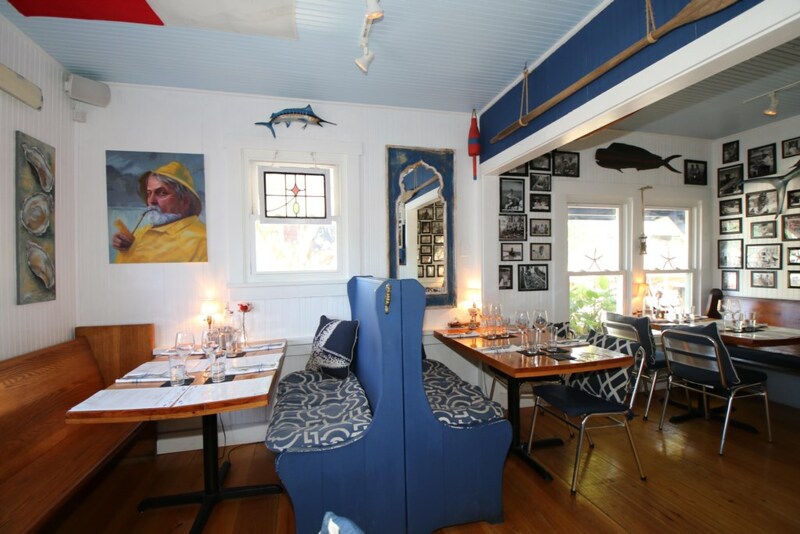 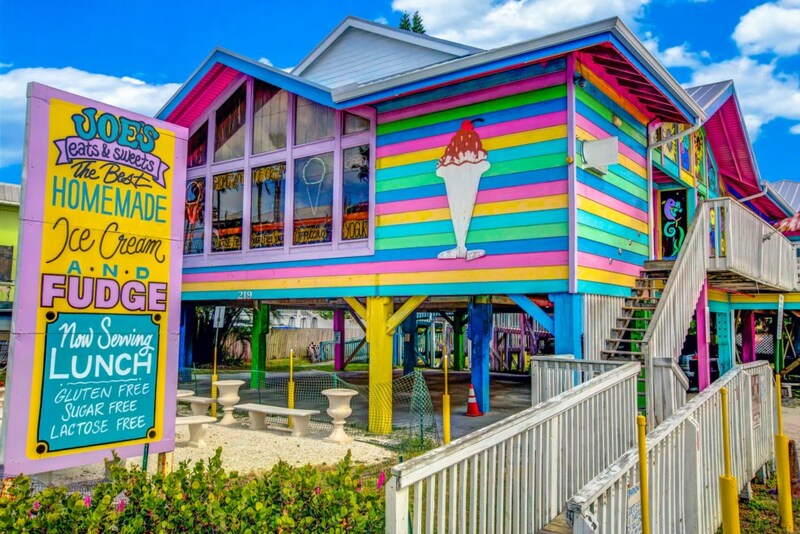 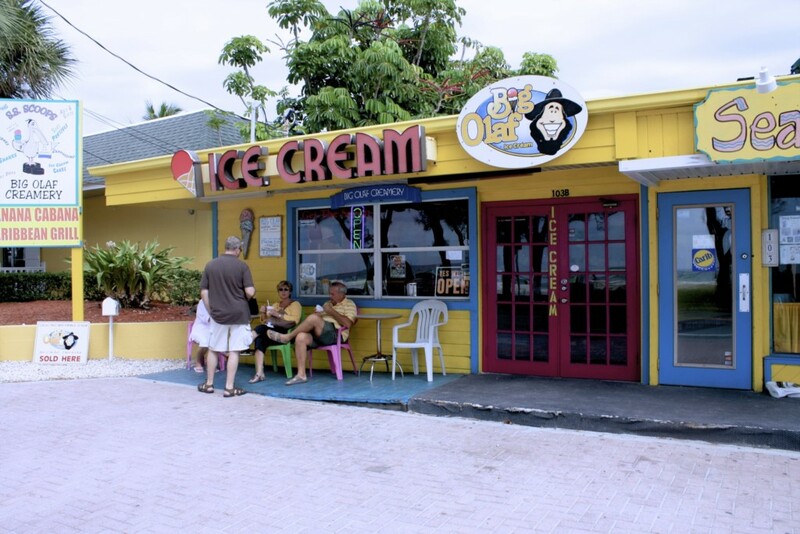 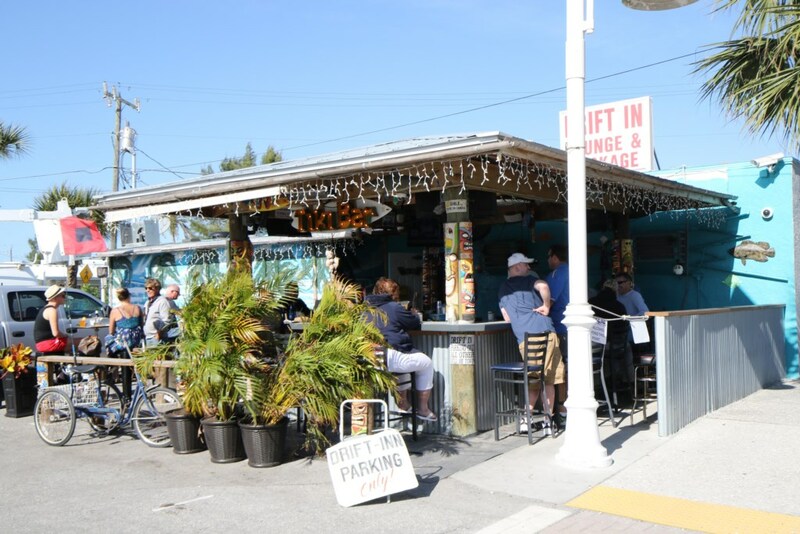 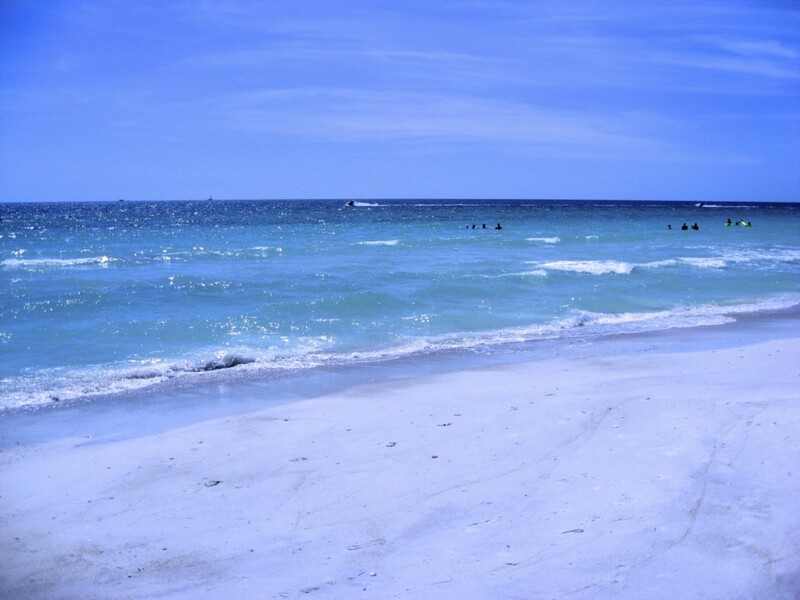 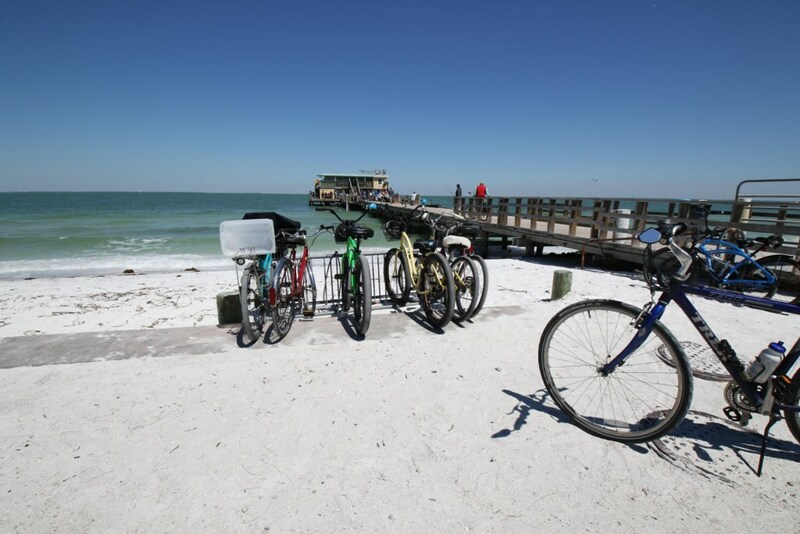 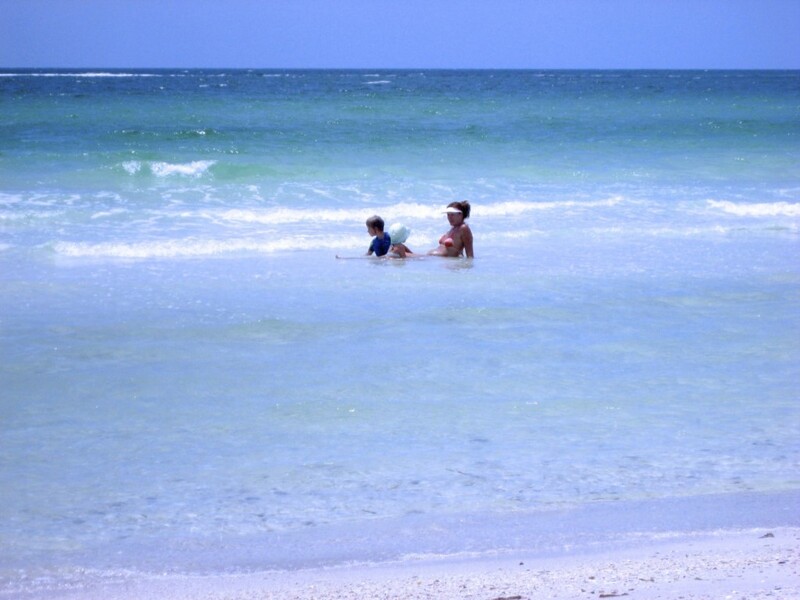 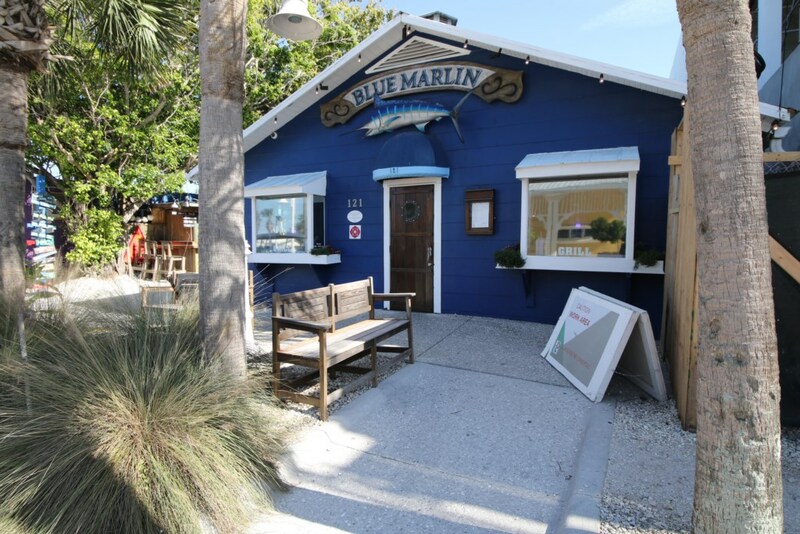 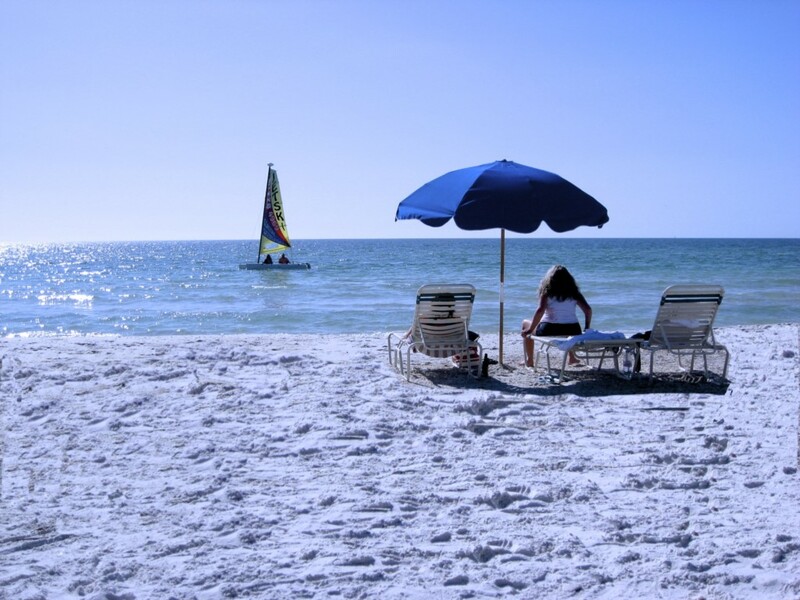 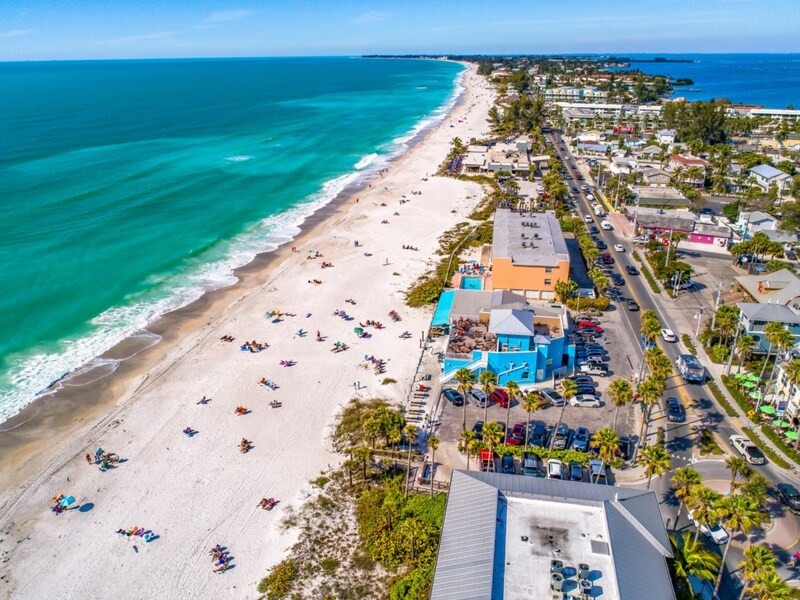 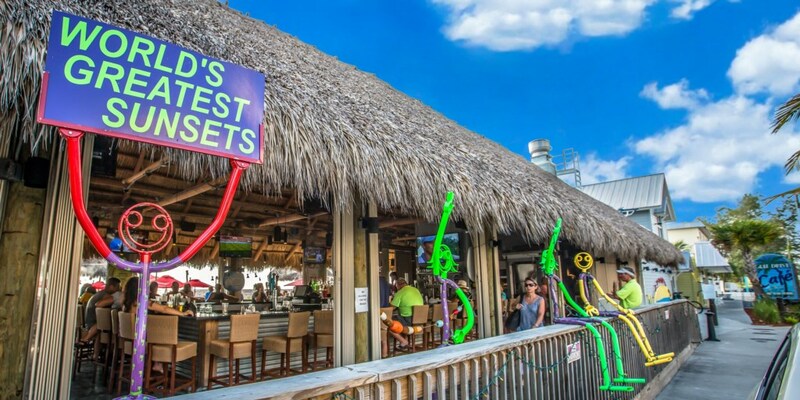 What you will surely appreciate the most about The Anna Maria Island Beach Palms is the unforgettable views of the sunrise in the morning and the views of the water in the evening while watching the boats sail by and the lights from the mainland. 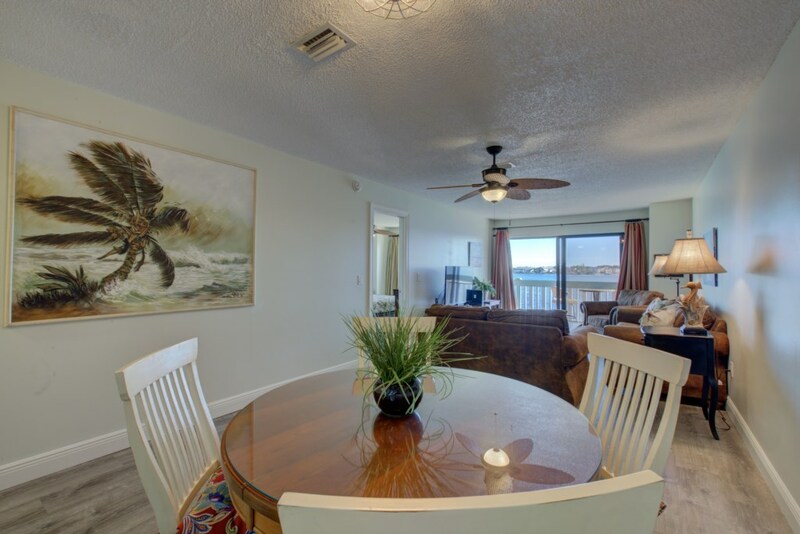 What is really unique about "The Beach Palms' is the number of dolphins and manatees that you a likely to see right in front of the condo and off the fishing dock. 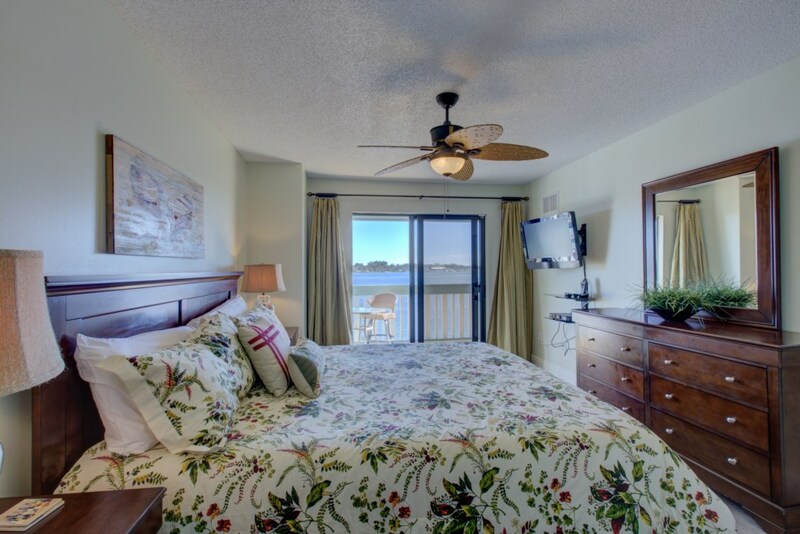 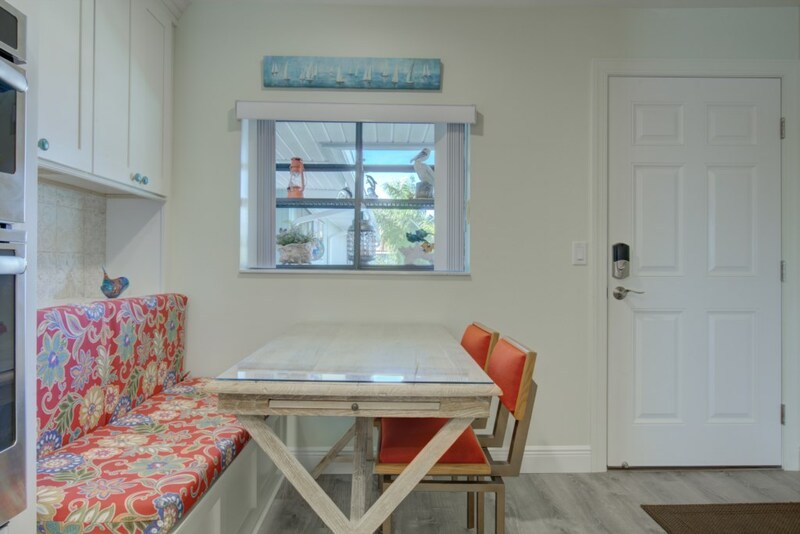 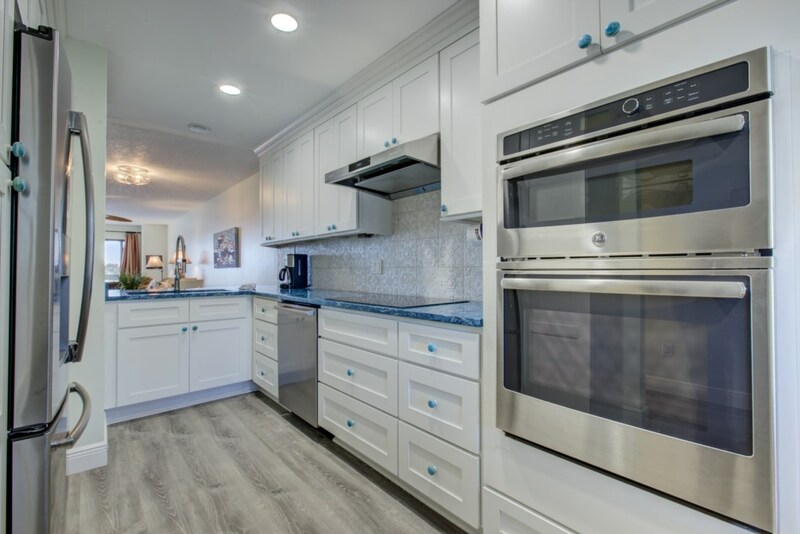 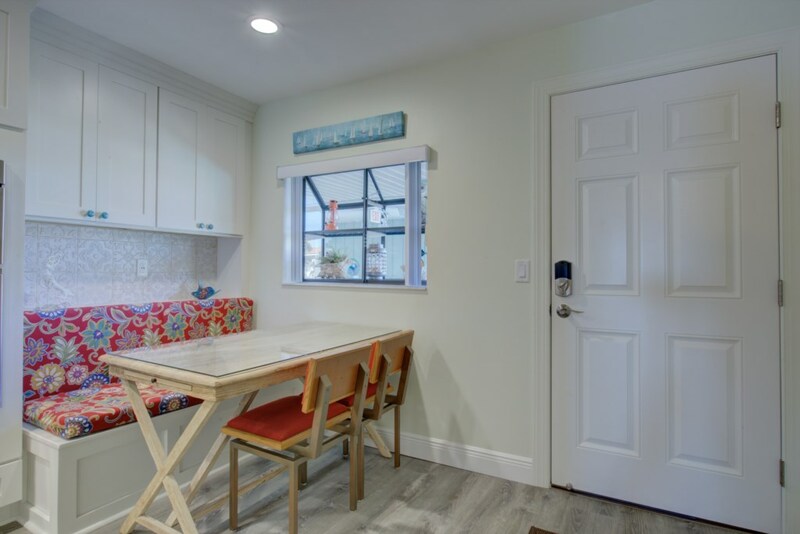 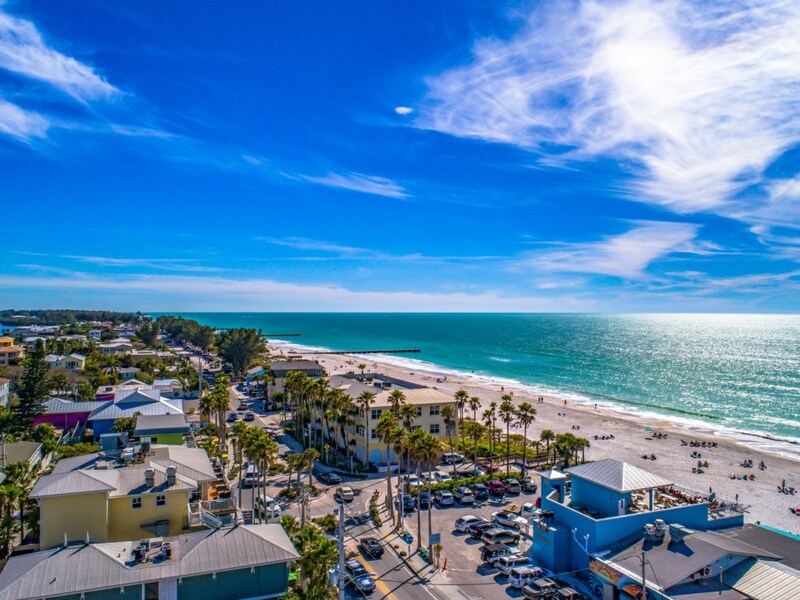 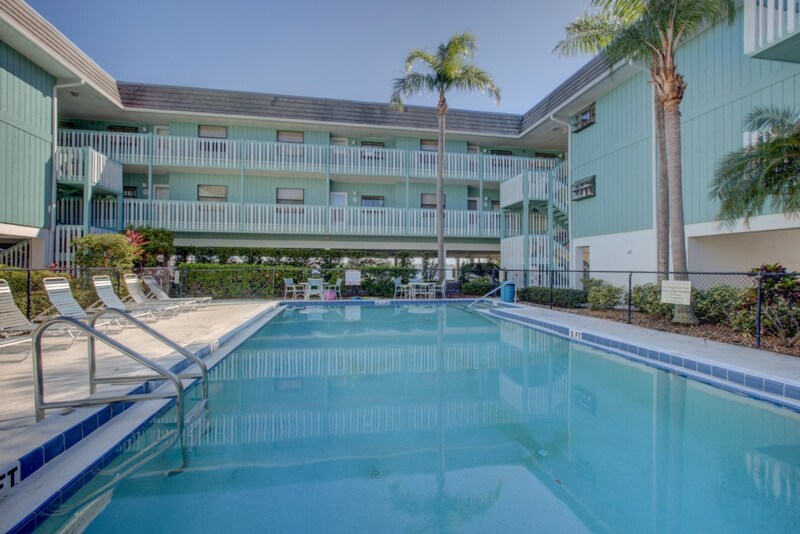 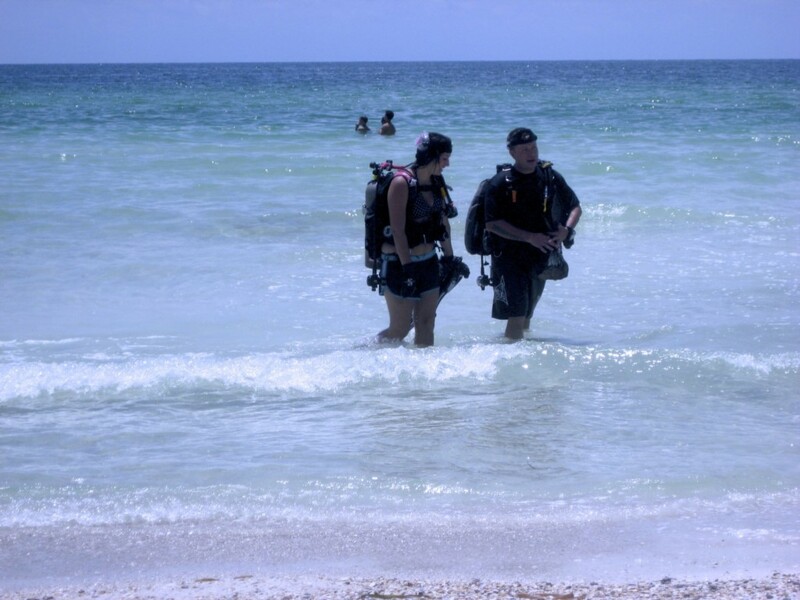 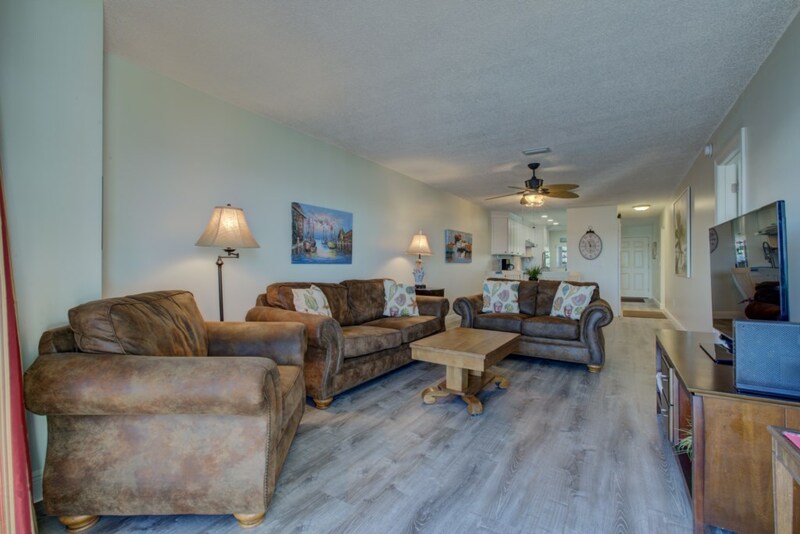 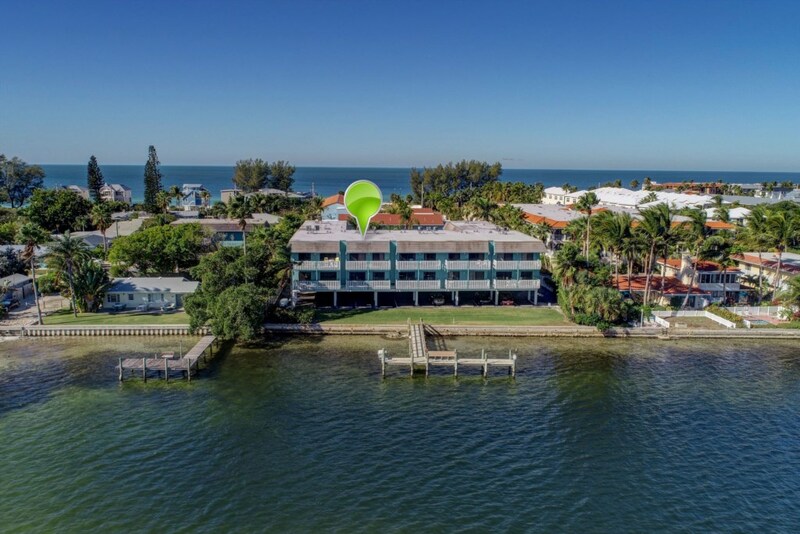 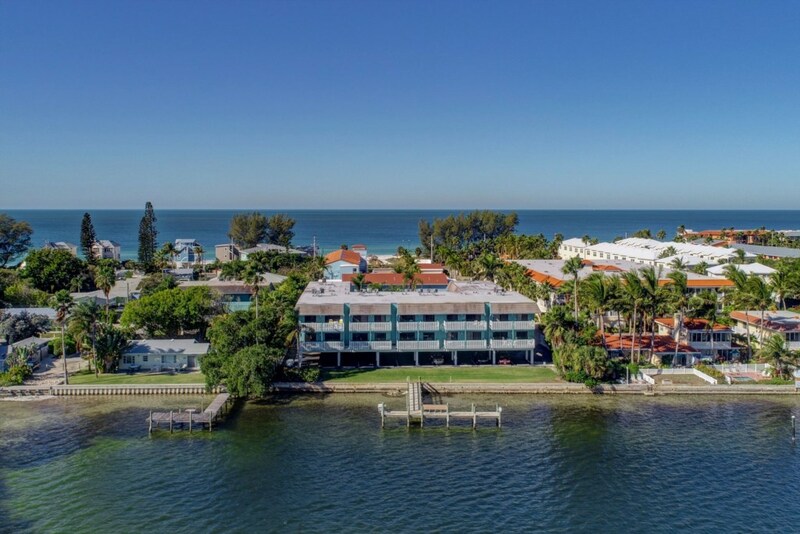 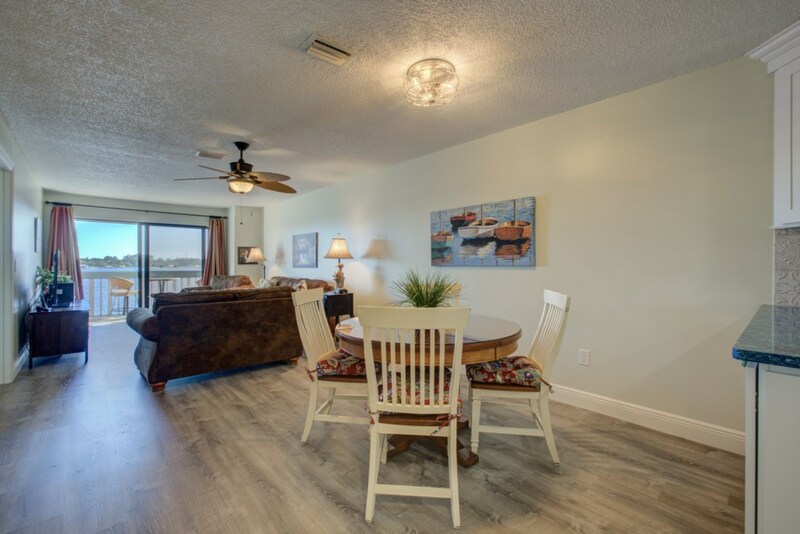 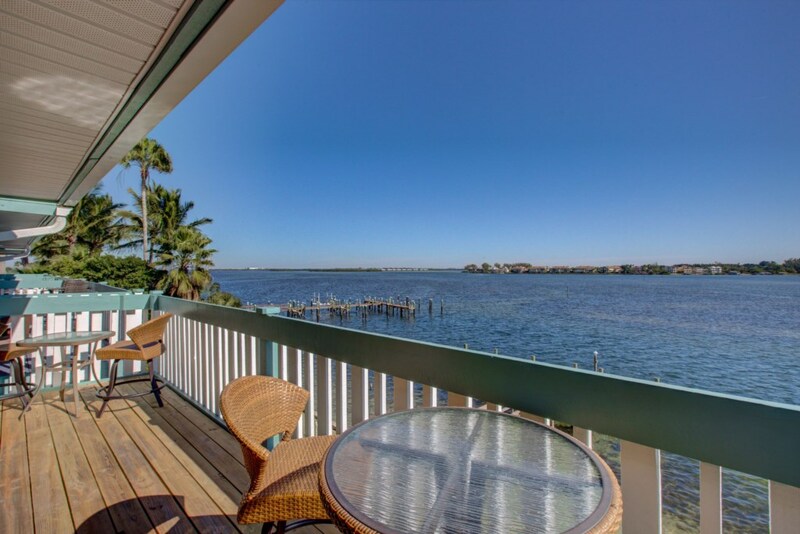 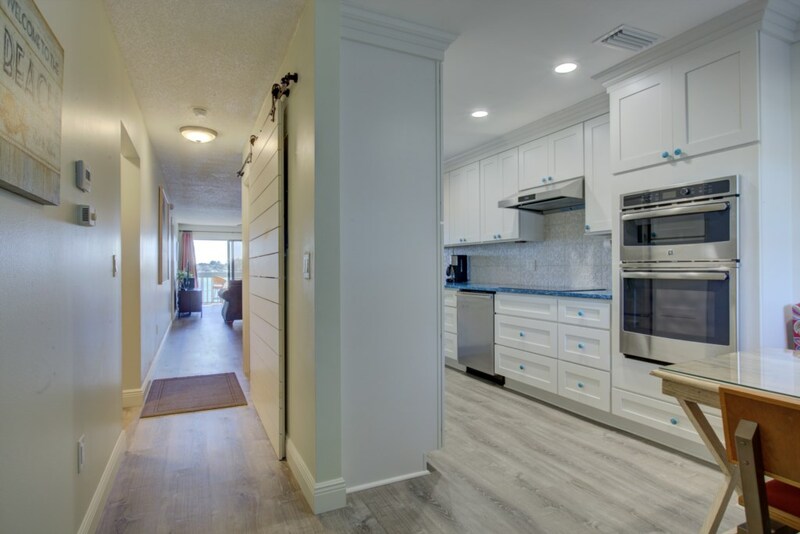 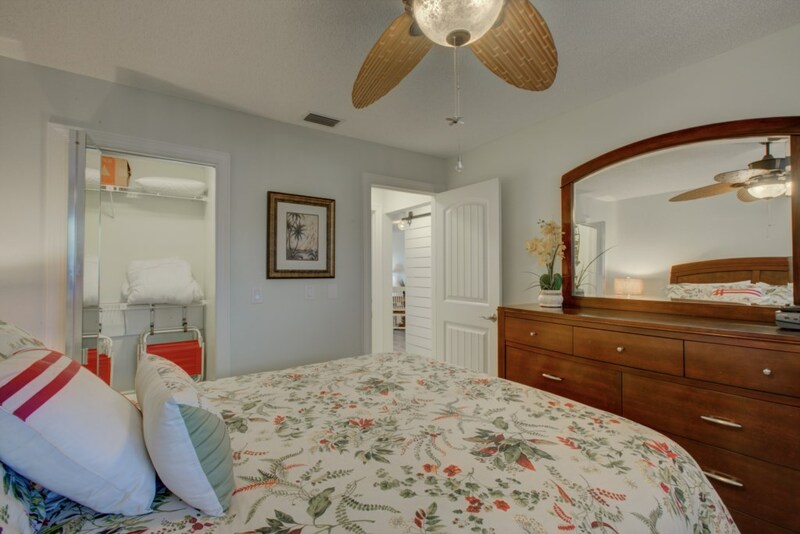 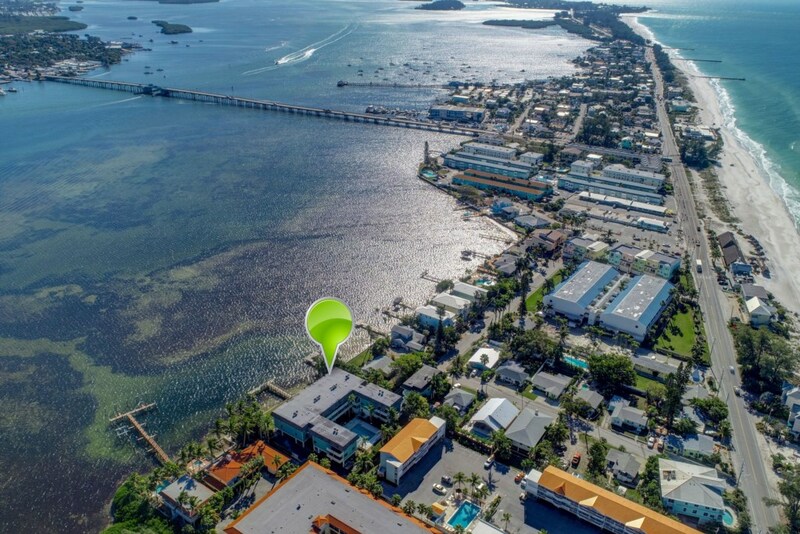 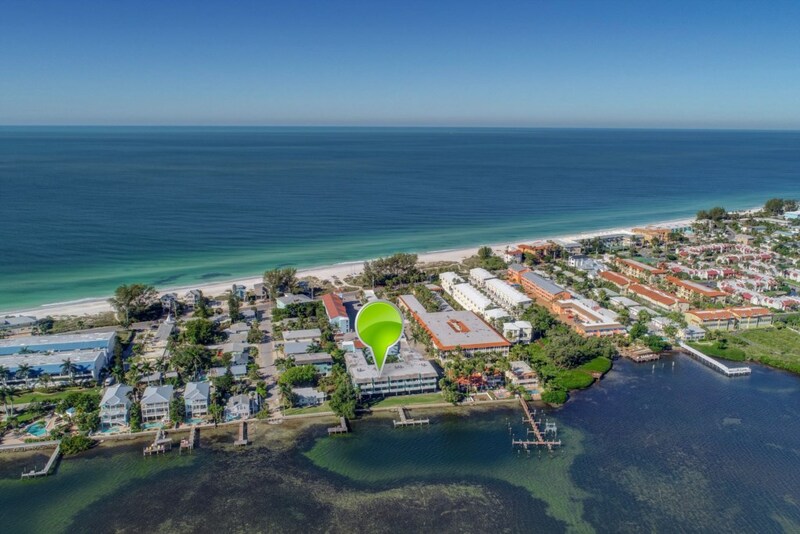 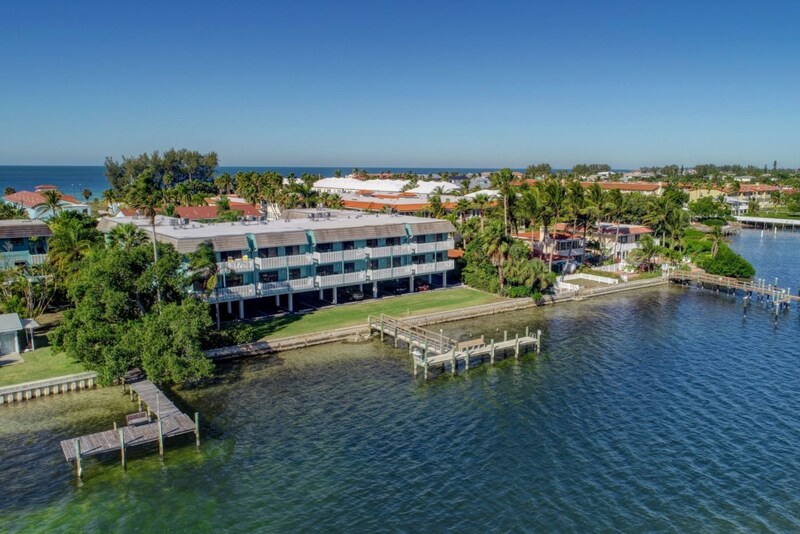 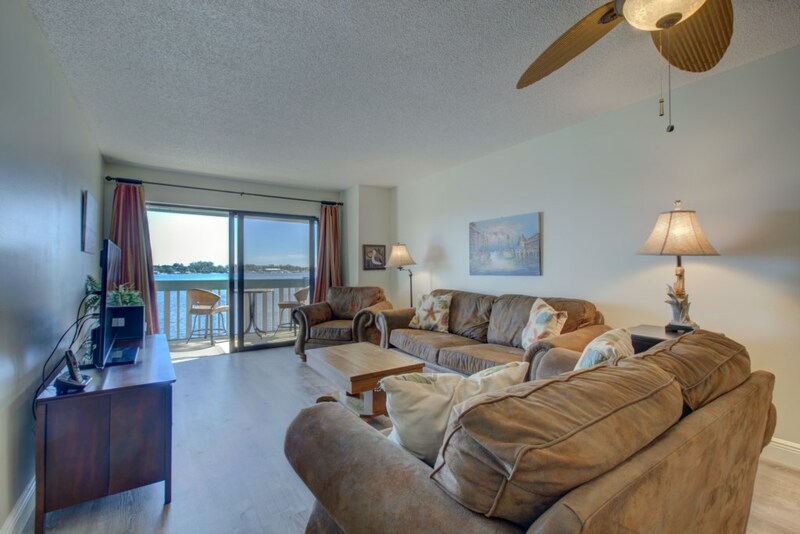 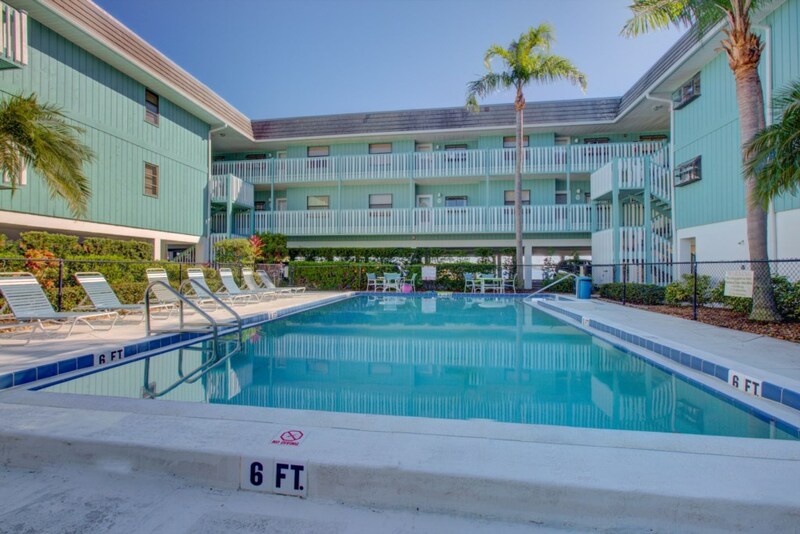 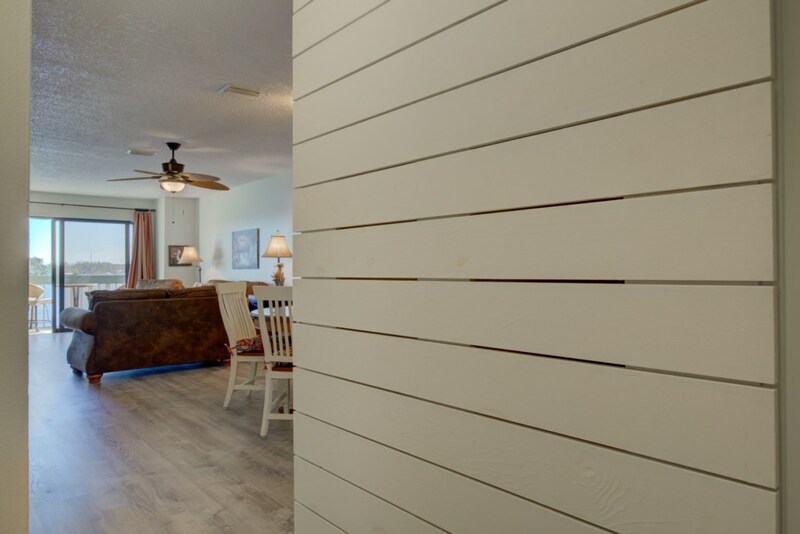 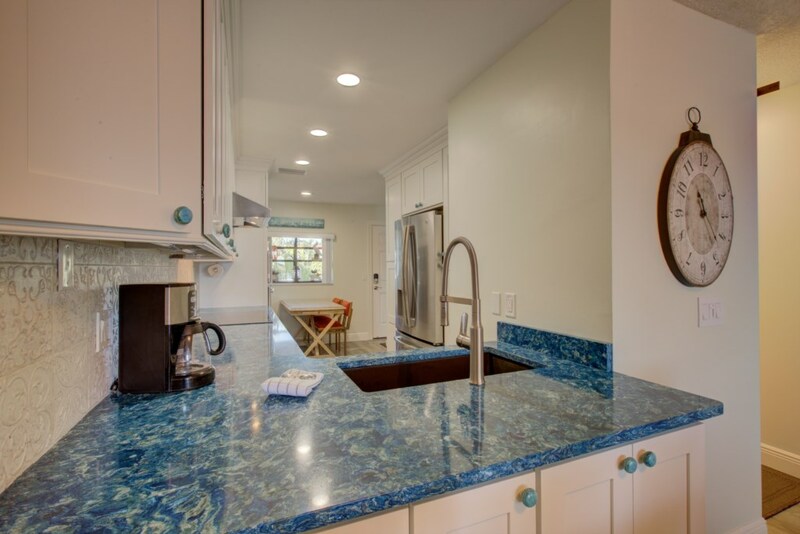 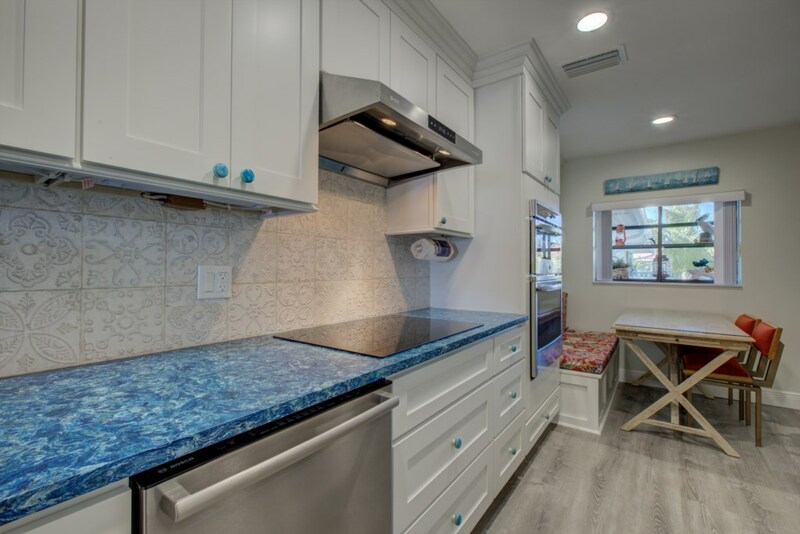 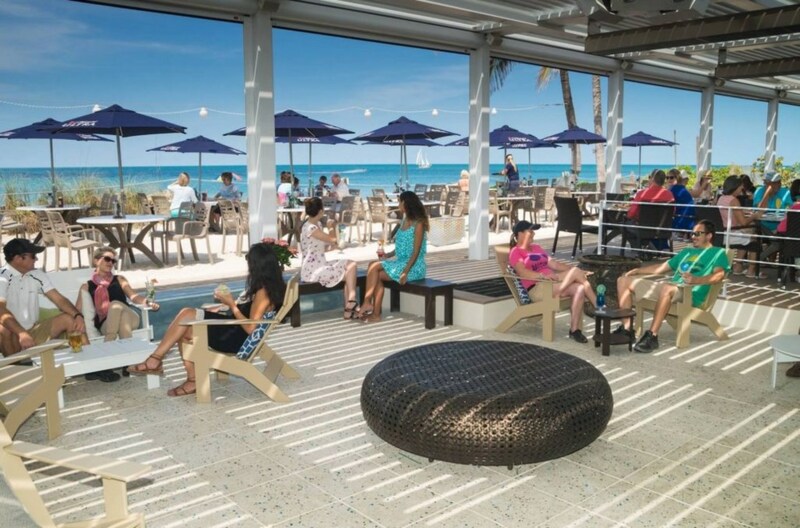 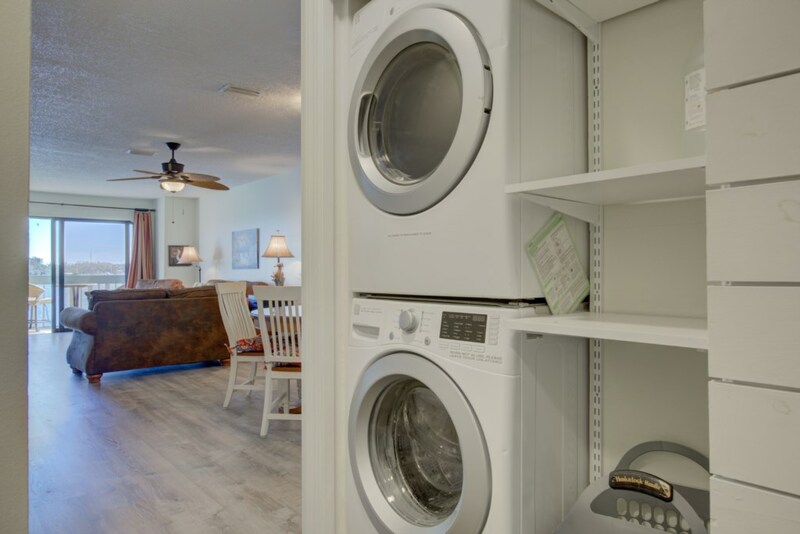 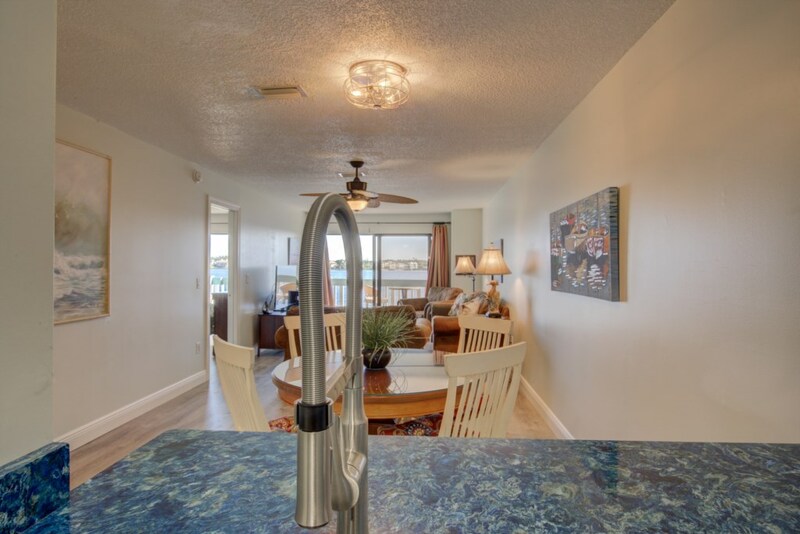 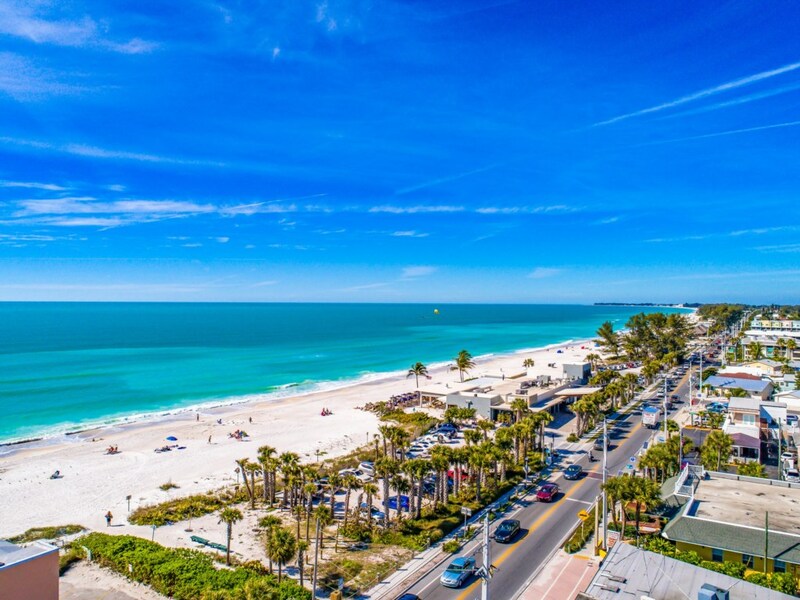 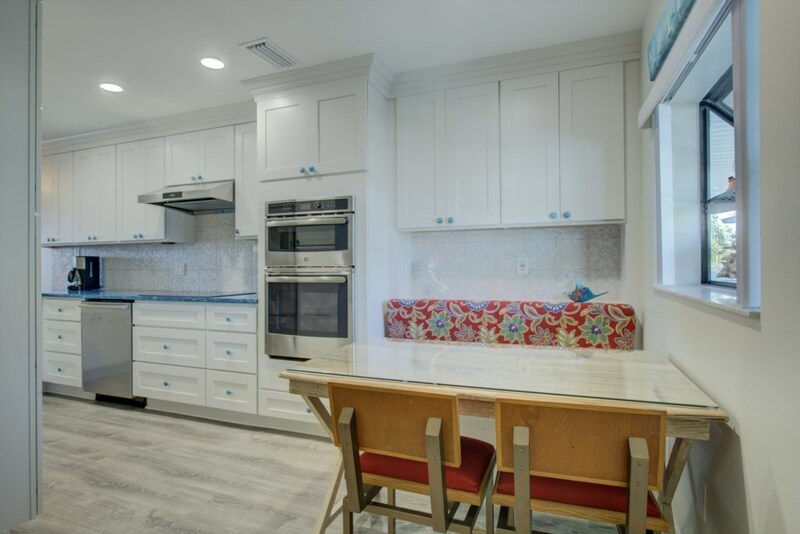 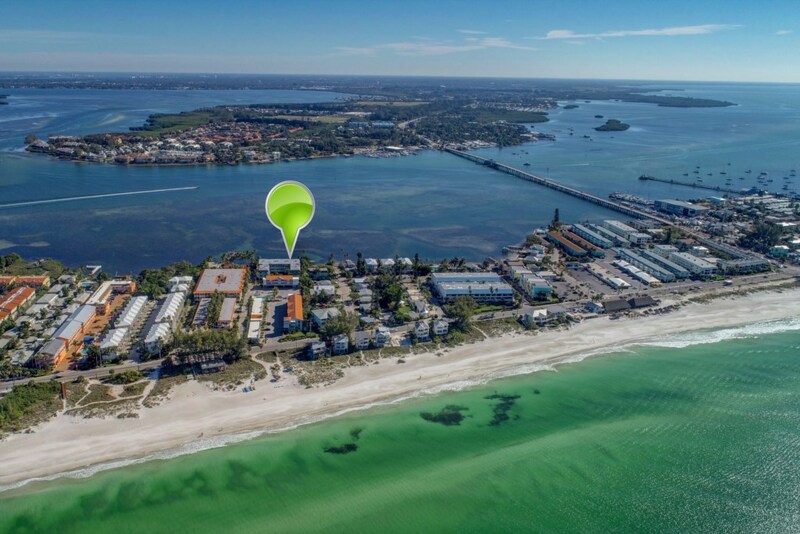 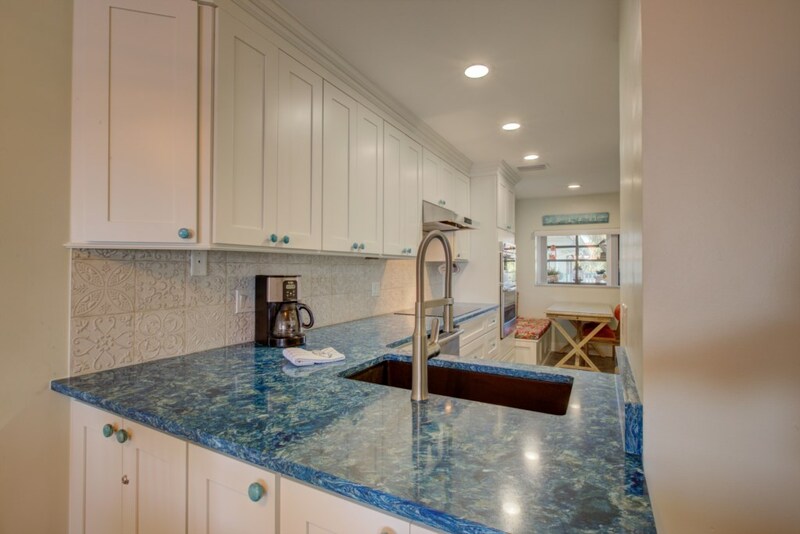 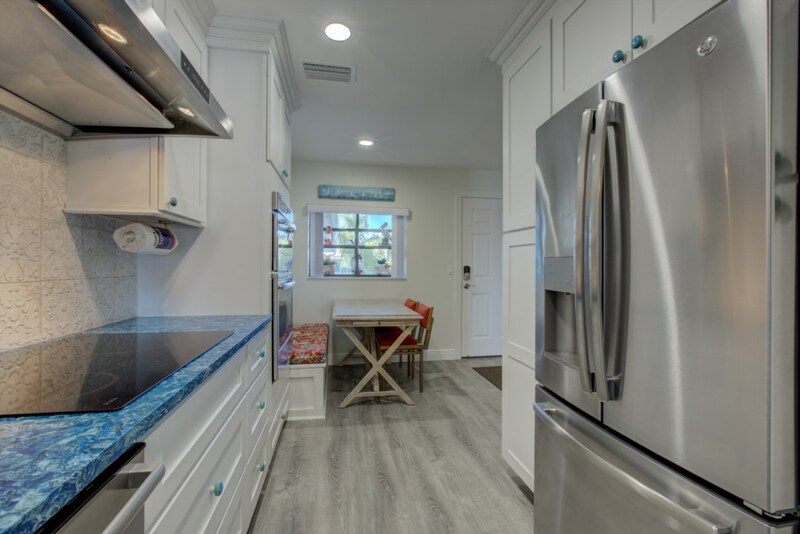 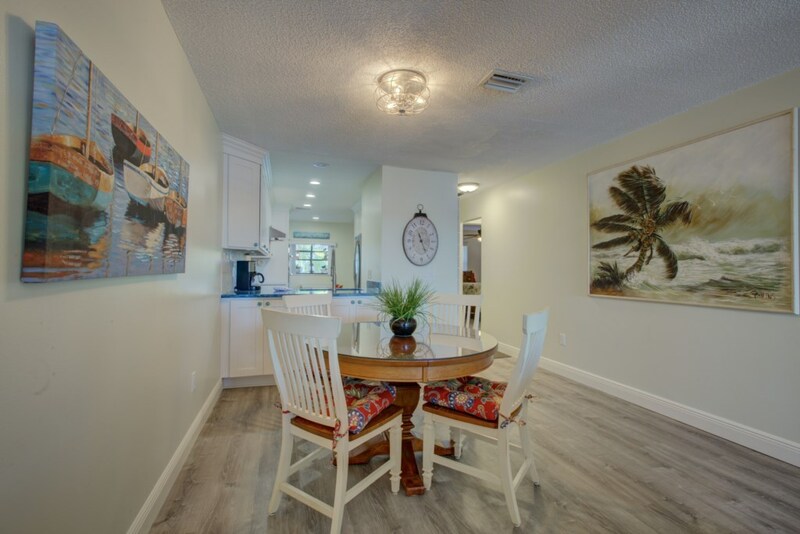 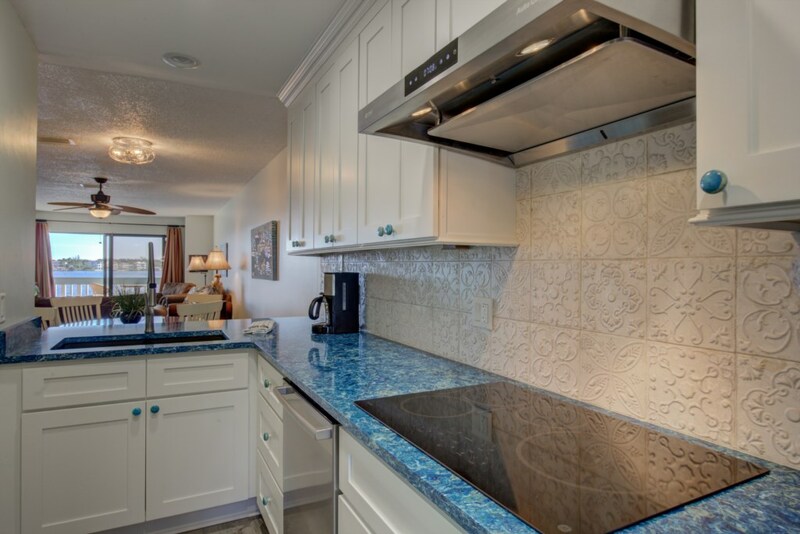 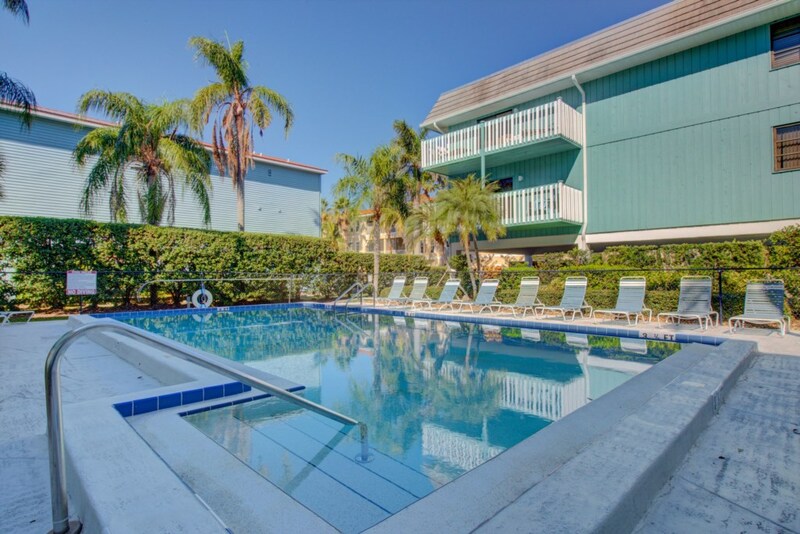 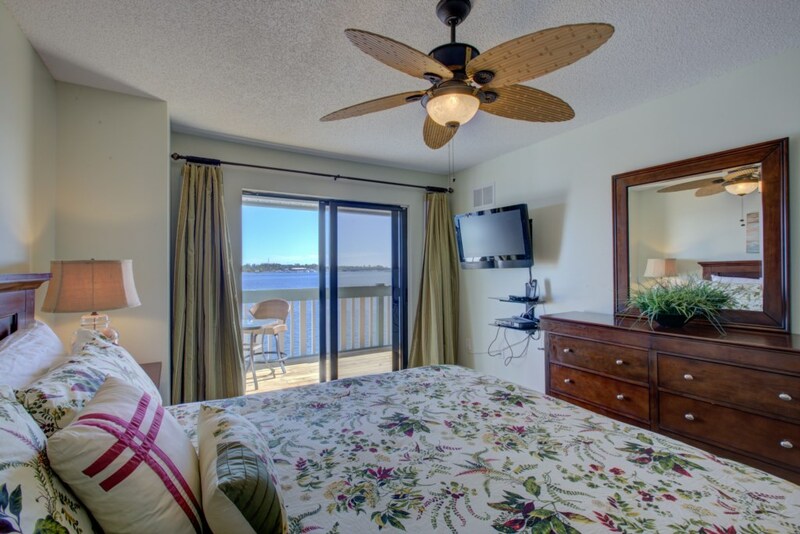 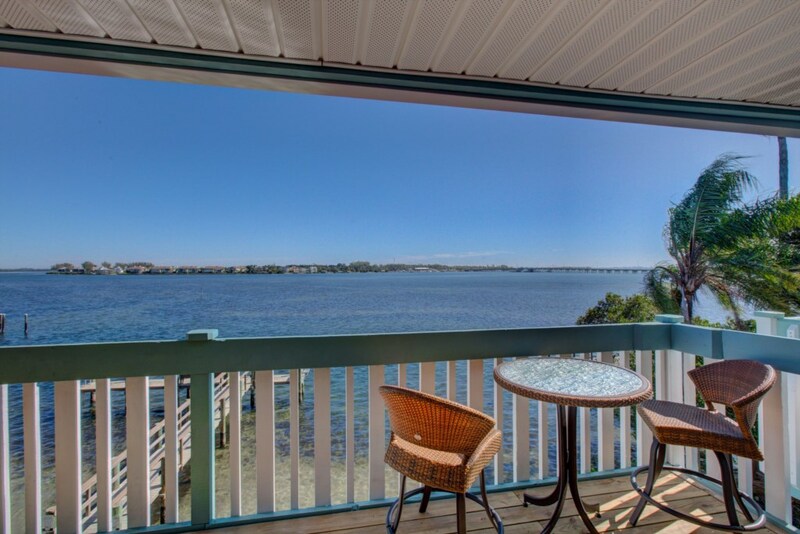 Enjoy the best of both worlds while vacationing on at "The Anna Maria Island Beach Palms" with Florida's Intra-Coastal Waterway on the east side of the condo and the heated pool and the Gulf of Mexico on the west side of the condo. 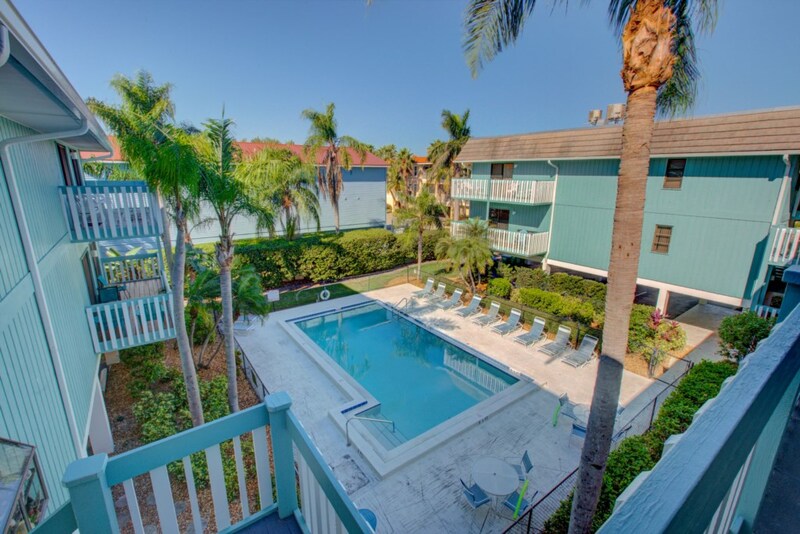 A one minute walk along the brick walkway will lead you to the beach.